We Went Down (and Not in a Good Way) – Room: Titanic – June 16, 2017 – FAILED! Play if… you enjoy a good ocean cruise. Avoid if… you have a fear of drowning, or just really, really hate Leonardo DiCaprio in that movie. Description (from the company website): Aboard the beautiful, new Titanic, you are surrounded by opulence on the journey of a lifetime… until you hit an iceberg. Trapped in your state room, can you find a way out using your ingenuity and wits before the water rises above the porthole? Staging Area: This is probably the swankiest location we’ve seen. Tons of seating AND A BAR (wine and beer, for Escapers only). There are also free lockers to stash your belongings before you enter the room. Description of the room: You enter the room and find yourself in the opulent quarters on the unsinkable cruise ship, the Titanic. Understanding of the Mission: Simple… escape your quarters and the level before time runs out (and your porthole fills with water). 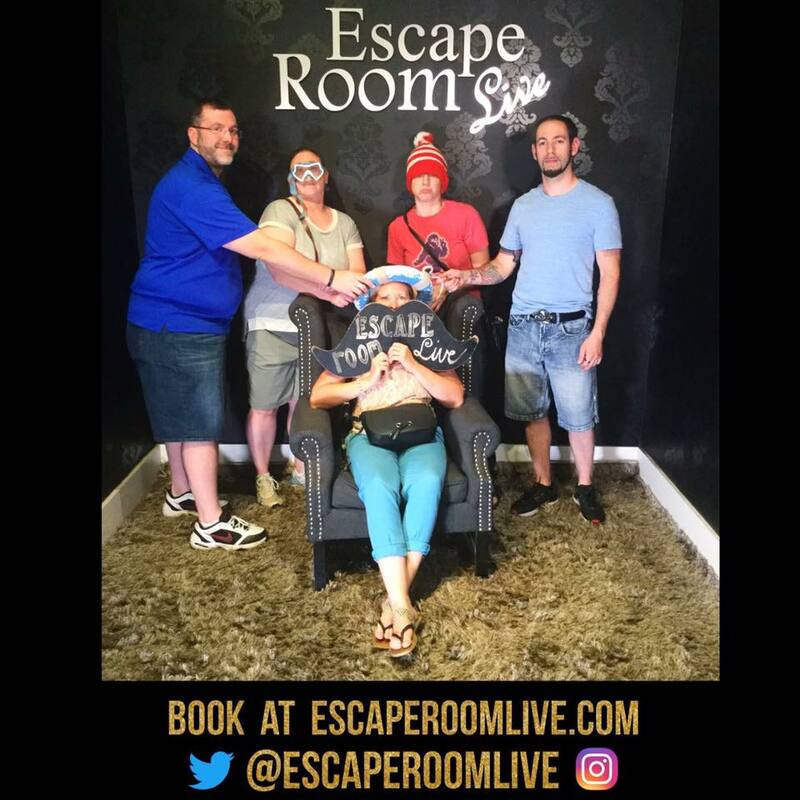 Team Disturbed Friends (Mike, Whitney, Birgit, Mindy and Jason) were lost at sea when they failed to escape the Titanic. Photo courtesy of Escape Room Live Georgetown’s Facebook page. Check out our interview with Jeff, one of the managers, at Escape Quest in Alexandria, VA after doing their King’s Ransom room. Check out our interview with Kyle Tharrington, co-owner of A-Escape, during our trip to North Carolina.